Lieutenant General Hemanta Raj Kunwar joined the Nepali Army as an Officer Cadet in the year 1979 and was commissioned as a Second Lieutenant to the Naya Gorakh Battalion in December 1980. During his years of service, he has held a wide variety Staff, Instructor and Command assignments. Besides various professional trainings and seminars within the country, he is a graduate of the US Army Rangers Course, Pathfinder Course, Instructor Course and Advance Intelligence Courses. He has also attended the Pacific Area Special Operations Conference in Hawaii, USA, International Special Operations Forces Conference in Florida USA, Land Forces Commanders Conference in Hawaii, USA, North East South Asia (NESA) seminar in Casablanca, Morocco and Asia Pacific Intelligence Chief Conference in Wellington, New Zealand. He is a graduate of the Defence Services Staff College, India and National Security and War Course, Pakistan. He holds a Master’s Degree in Humanities from Tribhuwan University, Nepal. Besides commanding the Naya Gorakh Battalion, Special Forces Brigade and No.5 Brigade, he held Staff assignments at Directorate of Military Training and Military Secretary Departments. He also served as the Commandant of Army War College, Nagarkot. He has worked as Military Assistant to the Chief of the Army Staff. After being promoted to Major General, he commanded Far - Western Division. He then served as Quarter Master and Ordnance General (QMGO), Director General of Military Intelligence (DGMI), Director General of Military Operations (DGMO) and Chief of Staff (COS). 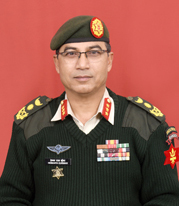 Lieutenant General Kunwar is appointed as Chief of General Staff (CGS) as of 16 September 2018. He has served in various UN Missions that include UNIFIL (Lebanon), UNGOMAP (Afghanistan and Pakistan) and UNOSOM (Somalia). He served as Defence and Military Attaché of Nepal to the USA from December 2005 to December 2008. In connection with his official assignments, he has also visited Canada, Sierra Leone, Iraq, China, Malaysia, South Africa, Australia etc. Lieutenant General Kunwar is decorated with the prestigious Suprabal Jana Sewa Shree, Gorkha Dakshin Bahu- III, Foreign Service Medal and different UN Service medals. He is also decorated with the Legion of Merit, USA. He is the Colonel Commandant of the Naya Gorakh Battalion. He is happily married to Mrs. Jyoti Kunwar and the couple are blessed with a son, Ashim.